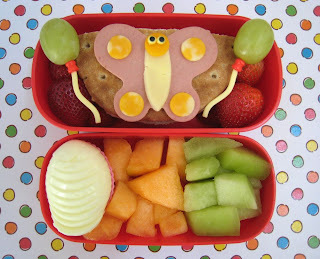 BentoLunch.net - What's for lunch at our house: Balloons & Butterflies Bento! Thankfully, I had this one on my camera, because we are out of most food. We are also out of the elements of food and had cereal for breakfast because I might have used the rest of the eggs & ham & turkey to make quiche yesterday and forgot about making a Kroger run. It happens. We do, however, have a plethora of fruit because I picked one of our big watermelons from the garden yesterday! Sliced half, trying to decide what to make with the other half, leaning towards a granita. Faith has a turkey & cheese sandwich on Nature's Own Whole Wheat Sandwich Rounds, cut in half to fit the box. 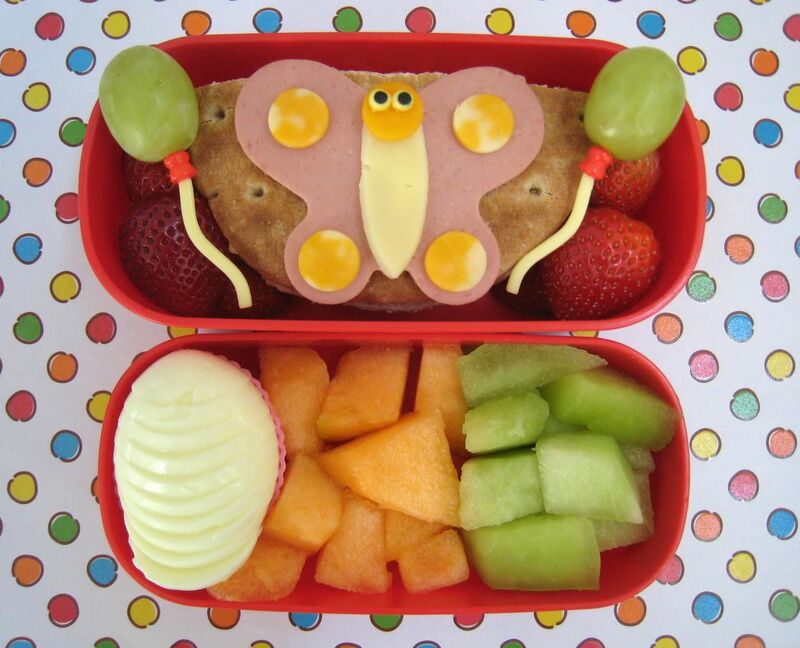 It's top with a lunch meat butterfly with marble cheese spots, a white cheddar body, orange cheddar head and a couple of sugar eyes. He also has some little grape balloons floating by him and a few strawberries. The bottom tier holds a sliced boiled egg, cantaloupe & honeydew. How cute!!! What are the balloon bottoms made out of? I was going to ask the same question about the balloons. Aw, such a clever cocoon! I came to ask about the balloon strings too! Any idea where we can pick those up? ?